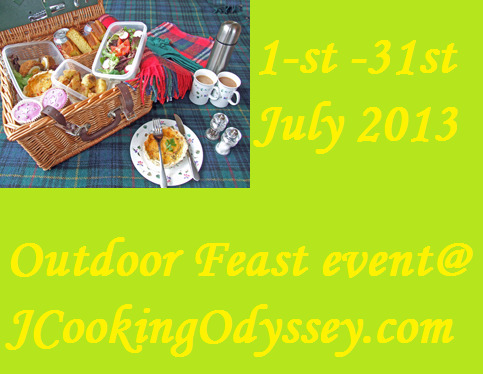 Jagruti's Cooking Odyssey: Event Announcement - Outdoor Feast ! Event Announcement - Outdoor Feast ! Summer hopefully means sunshine and picnics..what a better way to spend those glorious sunny and lazy days than in the park or seaside with family and a couple of friends..Alfresco eating becomes an obsession and what better way to indulge than with a picnic. So why not get your hamper out and head for your favourite picnic spot! Pack up on delicious sandwiches, veg pies, quiche, side salads, drinks and desserts and enjoy refreshing alfresco meals. Just make sure you keep a few things in mind while preparing a picnic, to keep food simple, tasty and portable. Also prepare dishes which can survive hot temperatures. Prepare any vegetarian picnic food like what is mentioned above plus paratha, pakoda or toasted sandwiches . Only vegetarian dishes allowed. Eggs allowed in Baking. What a fun event! I will be sure to participate. Nice Event,I have linked my recipe. Schezwan Paneer Wrap - Cherish those moments !